The owner of this 1950’s home came to Dalecki Design wanting to create a contemporary addition, transforming their small, two bedroom, one bathroom house into a three bedroom, two bathroom home suitable for a young, growing family. A limited budget, combined with a limited building envelope, meant the primary challenge of the project was to find a pocket of space on the block large enough to house the walk in robe, ensuite and living area additions, without encroaching on the outdoor living or garden area. A pocket of under utilised space, 5 metres wide by 4 metres deep housing an unused carport and store room was identified as the best location. Whilst this space was the most logical choice for the location of the additions, it still came with it’s own challenges. Due to the fall of the land, the existing house was quite built up, therefore a sunken living space was opted for, meaning the living room addition could be built right up to the boundary, without dominating the neighbouring property and still complying to planning codes and polcies. One of the client’s primary wishes was for the additions to be a light, bright and functional space. 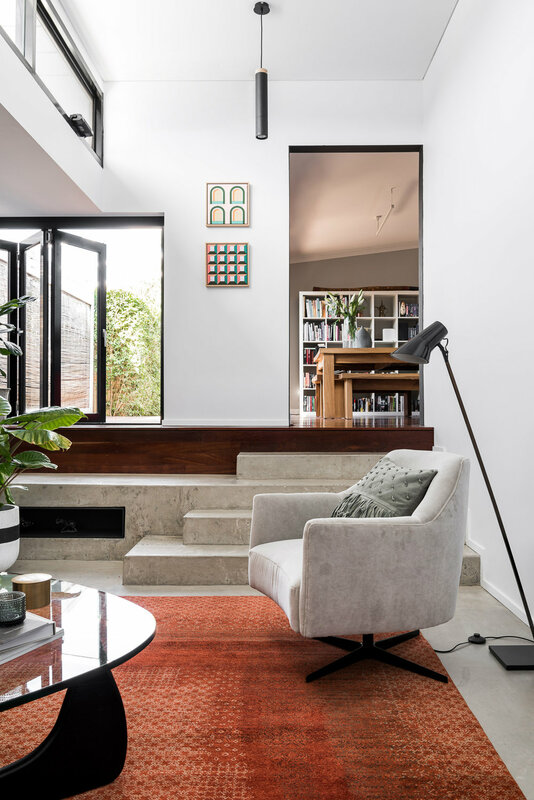 Given that the new living room was built right up to the boundary, a stepped ceiling was designed with highlight clerestory windows, allowing every square metre of available space to be utilised, whilst still taking advantage of the north sun to filter natural light into the room. These highlight windows also supported over height, 3.5 metre ceilings, increasing the overall volume of the room and creating the illusion of space within the small footprint area. Wanting to achieve a connection with the outdoor alfresco area, Dalecki Design created a feature of the room’s entry stairs, incorporating a day seat and large window opening up onto the alfresco area. This day seat window also serves to cool the room in conjunction with the front façade feature window, capturing the southwest breeze and directing it through the room to naturally cool the space. The client’s love of raw, unfinished products influenced the material selections for the house addition. 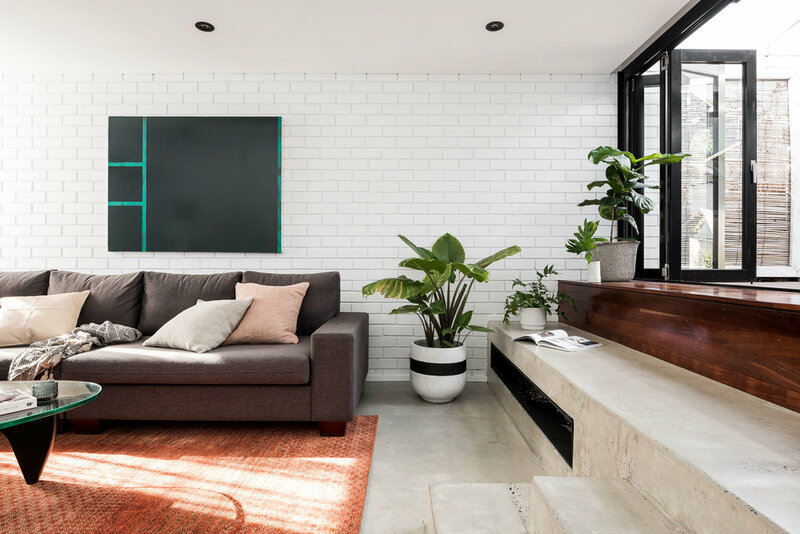 Painted brickwork and exposed concrete were utilised to intentionally contrast the material palette of the existing house internally, whilst also adding an extra dimension of textural interest to the small area. "Janik took our brief and ideas and transformed them into a unique, inspiring design that met our needs and our budget. He worked hard to gain approvals, produced excellent documentation and has a good network of builders. We have always found Janik quick to respond to queries and easy to work with."